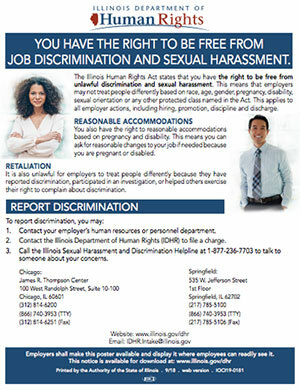 Recently, two government agencies issued new posters, and both are required postings for all employers in Illinois. The first was issued by the Illinois Department of Human Rights in September of 2018 pursuant to Public Act 100-0588. The poster is entitled “You Have the Right to Be Free From Job Discrimination and Sexual Harassment.” Employers can download a copy of the poster here. 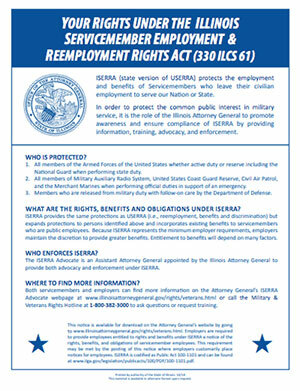 The second poster was issued pursuant to the Illinois Service Member Employment and Reemployment Rights Act (ISERRA), which becomes law on January 1, 2019. (The poster must also be displayed as of this date.) This poster was issued by the Illinois Attorney General’s Office and can be downloaded here. Employers should update their government postings board as soon as possible. Remember, members who wish to update their poster with something more than a printed copy from the government agency’s website can visit our partner GovDoc’s website to order a new all-in-one poster with a member discount. HR Source members with questions should contact us at 800-448-4584 or hotline@hrsource.org.